It has become apparent that my quilts want to design themselves. 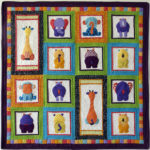 Each of my quilts begin with the fabric and, by listening to the fabric, the quilt design comes together. It will take just one fabric to grab my attention, then another one will want to join the party and before I know it I have a cheery gathering. Right about now I can hear you gasping as you wonder how I know how much fabric to buy if I don’t have a pattern or design already in mind. Well, this is the point when the fabric starts the design process. 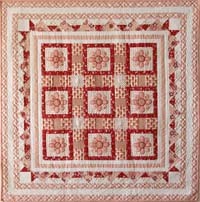 Let’s use my Avalon quilt as an example. 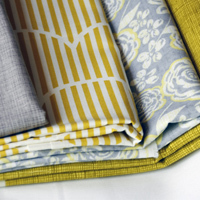 It all started with the grey, white and yellow rose fabric. 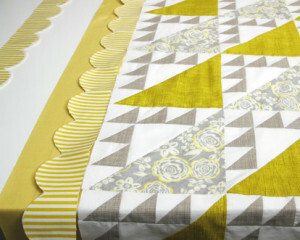 I added a grey and a chartreuse fabric. Both of them had a crisp linen look. The addition of the the citron stripe made it zing. To exaggerate the crispness I combined them with an antique white background. My thinking was that the grey floral and the chartreuse are the stars of the show so I bought more of them. The grey linen is the supporting act, so I bought less of it. The yellow stripe is the cameo appearance. It really grabs the attention but I wanted it to be a highlight, not to dominate the others, so I bought a smaller amount of this. The next stage is to work out a design that enhances the special qualities of the fabrics and that best used the quantities that I had bought. To continue with the theme, I wanted blocks that were crisp and sharp. I settled on a simplified version of the traditional Lady of the Lake block that has powerful lines when the blocks are repeated. Now I have the fabrics and the idea of a design. I calculate the fabric requirements needed to make sure I have enough. I print the pattern and start cutting. I don’t know about you, but I have a boredom threshold that doesn’t take long to reach. With this quilt I reached it pretty quickly. In my original design there are 64 blocks, 320 half-square grey triangles and 448 small white triangles. A quilter could go mad with this much monotony, so as soon as I had made 25 blocks, I laid them out and started to think about changing my initial design by adding more interesting borders. 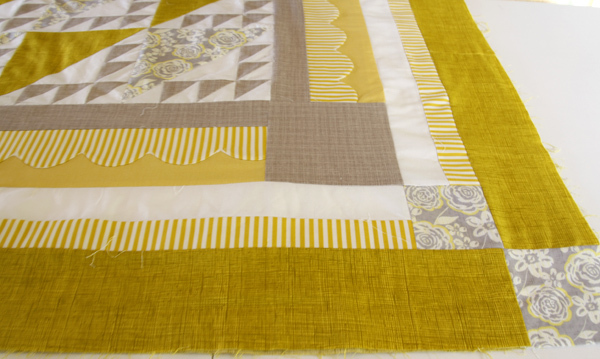 Conveniently, the citron stripe fabric had a scallop through it that I was inspired to cut out and applique onto a length of buttery yellow fabric. I will confess now that I did have to buy a little extra fabric for these borders. 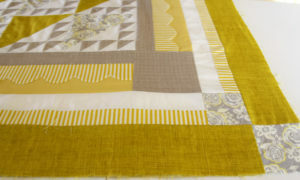 Once I had made the four scalloped borders I laid them out against the quilt. Sadly, the buttery fabric made everything look murky. The crispness had gone. 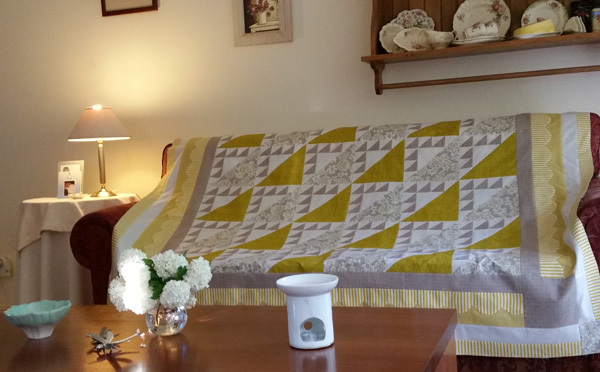 I played around with the fabrics and inserted a grey border before the scalloped border. To this I added grey cornerstones. Then late one afternoon I added a white and citron striped border. I pressed the quilt top and threw it over the lounge. Magic happened with the golden light of the late afternoon sun, a bowl of viburnums and my lemon china. It made such a charming photo. I knew I was on the right track. My dilemma now was whether or not to add another border. The quilt looked lovely and I could have stopped here but my heart felt it was unfinished. As soon as I added the chartreuse border with the floral cornerstones I felt goosebumps and knew I was done. 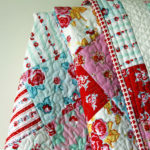 If the quilt fairies are kind to me I will get the quilt basted next week and get some more photos to share with you. 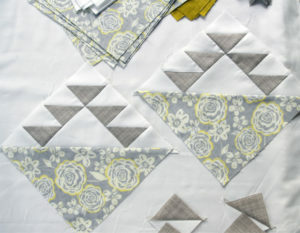 Update: The pattern is now available to download so you can make your very own Avalon Quilt. GREY: Heath Alexander Fashion for Home Collection / Gray. STRIPE: Graphic Nihon, Scallop Stripe / Citron.